An EIS team member provides scale in a massive landscape of crevasses on the Svnafellsjkull Glacier in Iceland. Its been up for debate for some years, whether the world is getting hotter due to climate change. Well finally someone actually caught proof on film. 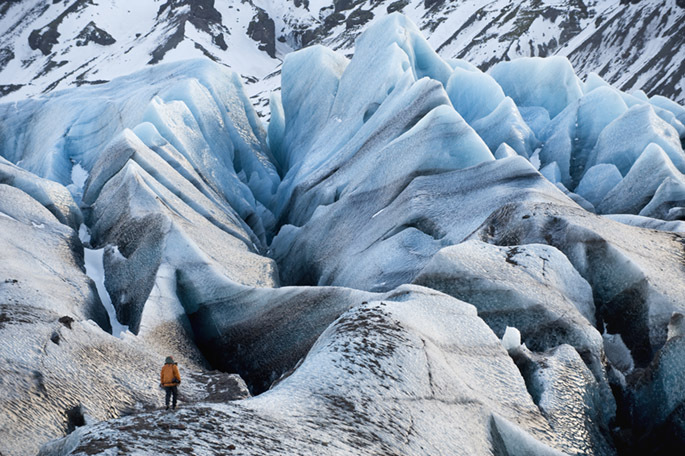 Photographer James Balog and his team were stationed near a glacier when their camera caught something terrifying. James and team were in Greenland gathering footage from all around the Arctic Circle, they’d been filming time-lapse footage from glaciers over the last few years. There were originally there to shoot scenes for a documentary, and while hoping to capture some extraordinary moments on camera they actually caught a huge chunk of a glacier snap right off and into the ocean before their eyes. While this may not sound like something that could change the world, it was actually the largest event of this kind caught on film. While speculation about this type of event is what scientists have been saying is happening to glaciers for years, catching it on film was a different story entirely. The piece of ice was actually the size of lower Manhattan–with the height being two or three times larger than the skyscrapers. As far as anyone knows, this was an unprecedented geological catastrophe and they caught the entire thing on tape. It won’t be the last time something like this happens either. If you are interested in learning more about what James and his team do and how this footage was used you can visit their documentary, Chasing Ice, that won an Emmy in 2014. English is not my native language, but where do you come from? Papua New Guinee?